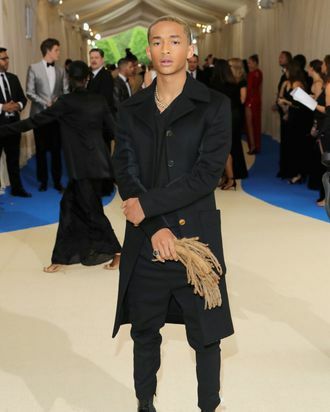 Jaden Smith Carried His Own Hair As a … Handbag? If you’ve continuously awakened in a cold sweat the past few weeks, pondering the fate of Jaden Smith’s forlorn dreadlocks, you can now put your mind to rest. They arrived with Smith on the red carpet tonight at the Met Gala, like a dreaded handbag of gold. You’ll recall that Smith had to part ways with his long, beautiful hair early last month as he geared up to film his upcoming movie, Life in a Year (which, incidentally, also stars a newly bald Cara Delevingne). Back then, his haircut was captured on Facebook when his dad, Will Smith, made the chop himself. That he kept his hair shouldn’t surprise you. After all, Jaden takes conservation seriously, and what’s more important than conserving yourself?